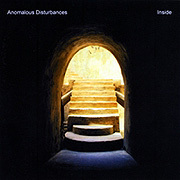 On the CD Inside (69'05"), Anomalous Disturbances moves beyond the subtle profundities of the minimal Ambient music he is known for. Effortlessly switching to a music laced with twists in tempo and mood and loaded with muscular riffs and sticky melodies, this album is a real gone ethno-ambient adventure. 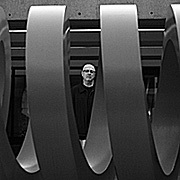 More than a mere side project, Inside shows primary Terrence O'Brien (guitar) continuing to grow as a composer - now in collaboration with his two brothers Chris (percussion) and Wayne (flute). They fill the empty air with sound and our eager brain space with images. From tribal fever dreams to floating synthetic textures and eruptions of soft form, this release shows the trio thinking with their hands. As seductive percussion runs shift the shape of the rhythm, powerhouse bass delivers the crunch while silvertoned guitar lead lines snake above. A few of the eight tracks possess a pronounced inward quality - a withdrawn beauty. These space creating sound images are quietly ambitious in their aural poetry of place and atmosphere. Overall, this is a wonderful work full of complex pleasures for the ear. Inside seems fresh, disquieting and utterly unexpected - an evolution of O'Brien's distinctive musical language and increasing inclination toward linear narrative structures.